The other day I was sat in the garden watching a bumble bee dizzy with nectar and weighed down by pollen sacks. It slowly clambered from one flower to the next, before clumsily toppling from its perch like a miniature striped acrobat to land, slightly bemused, at the foot of a plant pot. I continued to observe and to check up on its recovery, until it had regained enough strength to continue its intoxicated flight path across the garden. It is fair to say I have a soft spot for bees, I love their little furry knees and round plump bottoms, the erratic way they zip from flower to flower and the hypnotic hum that emits from the beat of their fragile wings. I am reminded of an embarrassing story from my past; one my parents like to bring out on special occasions and when I was still single, share with any potential new suitor. Picture a 7 year old version of myself, messy haired, grubby faced, scrabbling around in the garden turning over stones and shrubs in search of dead bumble bees. Now this may appear macabre to the casual observer however I am actually embarking on a project for school. We had been learning how to make a mobile out of old coat hangers and were tasked with creating one for show and tell which featured one of our favourite things – for me it was a toss-up between cheese or bumblebees, I went with the latter. Needless to say when I showed up at school a week later wielding my mobile made of dead bees the school called my parents, who dutifully came in to meet with my teacher and put his mind at ease. “It’s ok” explained my mother “they were dead when she found them, she would never hurt a live bee.” My teacher looked slightly relieved until my dad chipped in: “You’ve had quite a lucky escape actually, Juanita also likes to collect dead birds she finds by the side of the road, to take home for a proper burial – imagine if she’d made a mobile out of those!” I am not entirely sure this was how my teacher expected the conversation to go but needless to say the school never invited my parents back again to discuss my behaviour. Back in the present day and shortly after the ‘drunken’ bee incident I received a big brown envelope in the post. Inside were two beautifully hand drawn pictures and a card from a young girl up in Scotland call Mia, who had watched my journey on MasterChef. 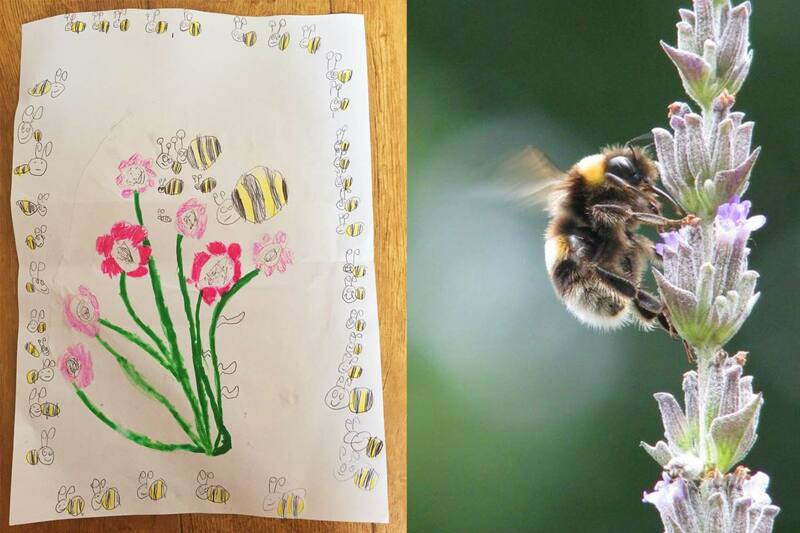 One of the pictures she’d drawn was a beautiful montage of flowers and bees (see image below). This got me thinking about the ‘powder puffs’ of the insect world again and so I did a bit of research online. I’d always been aware of the threat bees were under but as I delved a little deeper I was saddened by what I read. Left to right: By Mia aged 7. By nature. The harsh truth is that the bee population is dying out and with the disappearance of these critical pollinators so goes one-third of the food we consume so freely. Bees and other pollinating insects play an essential role in our ecosystem, pollinating around 70 of the 100 crop species that feed 90% of the world, including some of our favourites such as apples, strawberries and tomatoes. If that’s not enough, the knock-on effect is that any plants they pollinate are also at risk of extinction and in turn any animals that rely on those plants for food. Being a lover of bees, animals and food this shocked me into action and so I looked at what we could do to help prevent the extinction of these precious creatures. Plant Bee-friendly plants: Bees find blue, purple and yellow flowers most appealing. So let’s get buzy and make one change today that could help save these beautiful and incredibly important creatures from extinction.